ASWGA recognises industry excellence by facilitating and supporting wool competitions both regionally and nationally. Current entry forms will be available when competitions are announced. The Ermenegildo Zegna Group is one of Italy’s best-known and most dynamic family businesses. Young entrepreneur, Ermenegildo founded the family’s first wool mill in Italy in 1910 to create woollen fabrics that had to be “the most beautiful in the world”. Even then, Ermenegildo had an international vision, ahead of his time, to source the best quality natural fibres, directly from their country of origin. Zegna has long been a supporter of Australian wool. Today, Zegna are one of the biggest global producers of fine fabrics from noble fibres. To celebrate the importance of wool and to incentivise wool producers to evolve the fineness and excellence of this fibre Ermenegildo Zegna holds competitions to encourage Australian wool growers. 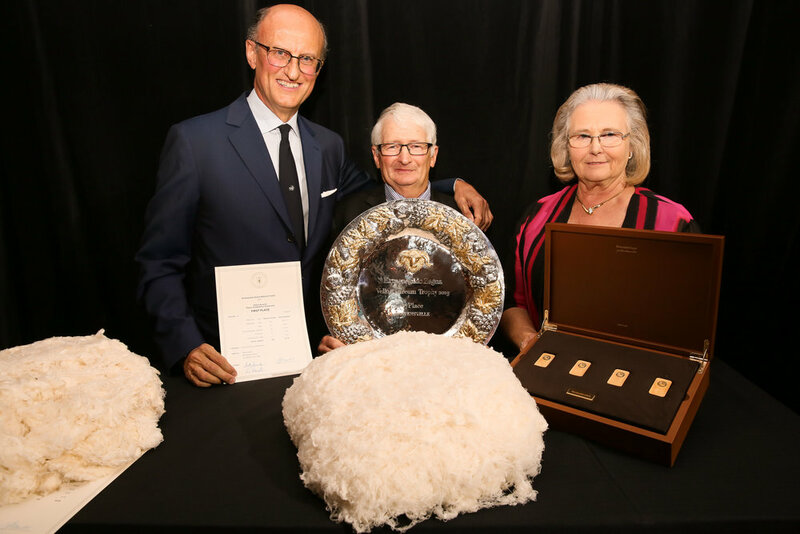 The Ermenegildo Zegna Awards, now recognised worldwide as the most important competition in the wool industry, commenced in Tasmania in 1963 when the first Ermenegildo Zegna Perpetual Trophy was presented. In 1980, ASWGA and Zegna launched a national competition, the Extrafine Wool Trophy, to recognise the dedication to excellence shown by all Australian fine wool growers. In 2002 a second competition, called Ermenegildo Zegna Vellus Aureum Trophy was introduced. The competitions have grown in popularity and are now a highlight of the wool industry calendar. The 2019 Superfine Wool Trophy was won by David and Angie Waters (Tarrangower Merinos - Hillgrove, NSW), with Allan and Carolyn Phillips (Glen Stuart – Deddington, Tasmania) and Ed Hundy (Windradeen Mudgee -Pyramul, NSW) taking 2nd and 3rd place respectively. The winners, David and Angie Waters took first place for the third year in a row while the Phillips and Hundy families have been among the winners for the last 7 editions. Rose Villa (Ross-TAS), Snowhill (Avoca-TAS), Macquarie Hills (Longford–TAS) were for the 1st time in the final ranking. The winners of the Vellus Aureum Trophy were David and Susan Rowbottom from “Rowensville”-St. Helens, VIC. Aaron and Rebecca Rowbottom from “Myndarra” – Orford - VIC and Robert McClenaghan from “Rockvale North”- Armidale, NSW were respectively 2nd and 3rd in the competition for the first time. These woolgrowers were awarded by Paolo Zegna during the celebration dinner held at Luminaire, Melbourne on Tuesday 16th April, in the presence of representatives of the major institutions associated with the world of wool. ASWGA holds an annual national Fleece Competition. The first place prize winner receives the Cleckheaton Grand Champion Fleece Trophy sponsored by the Australian Yarn Company. These awards are divided into four categories to better represent traditional fine crimping wools. Based on the Bradford score the categories are 90s and finer, 80s, 74s and 70s. Scores are given for the fleece attributes of weight, quality, yield, trueness, uniformity evenness and excellence. Winners are announced from each ASWGA region Albury-Wodonga, Ararat-Barunah, Goulburn-Yass, Hamilton, Mudgee, New England, Tasmania and Western Australia. Congratulations to Lesleann & Mark Waters of “Riverton”, Armidale for their win in three categories of the ASWGA Fleece competition, the classes 74’s along with first place in the New England region and the big one, the “Cleckheaton Grand Champion” Trophy for the best overall fleece. Mark & Lesleann Waters of Riverton with their Grand Champion Trophy and winning fleece. There were nearly 80 fleeces entered in this years competition and the results were very close. Presentations were made at the recent ASWGA Presentation Dinner held in Goulburn on the 19 May by Tony Stills of Betta Wool representing our sponsor Bendigo Woollen Mill. “We were thrilled to win the annual ASWGA fleece competition. There were many very good quality entries and that made it all the more special for us. It has always been our plan to enter top quality produce so we can score highly. Ideally, we try to have a fleece on view at the annual dinner where the best fleeces from other regions are displayed. We have been fortunate to have had fleeces on display at all five competitions to date. Mark & Lesleann Waters of “Riverton”, Armidale NSW, Cleckheaton Grand Champion Fleece Trophy, the Class 74’s and first in the New England region. Lyndsay & Noel Henderson of “Avington Merino”, Sidonia, Victoria, first in the Class 70’s and first place in the Ararat/Barunah region. Trevor & Kathy Mibus of “Glenara Merinos” Dunkeld, Victoria, first in the Hamilton Region. Robyn & John Ive of “Talaheni”, Yass Valley, first in the Goulburn/Yass Region. Penny & Andrew Hundy of “Windradeen”, Mudgee, NSW, first in the Class 90’s. Jill & Ed Hundy of “Windradeen”, Mudgee, NSW, first in the 80’s and first in the Mudgee region. Michelle & Luke Rapley of “Plassey Rural”, Ross, Tasmania, first in the Tasmanian Region. James & Faye Pepper of “Mumballview”, Mumballup, Western Australia, first in the West Australian region. A huge thank you to our sponsor Bendigo Woollen Mill for the grand trophy and to AWTA for arranging the testing and transport of fleeces for judging. We would also like to thank Roberts Ltd, Australian Wool Network, Schute Bell Badgery Lumby and Landmark/Jackson of Geelong for facilitating the judging, collection and transportation of the members fleeces. It was a huge effort and greatly appreciated by the Association. A special thanks to the Fleece Competition Committee who has, as always, done an excellent job, especially given the number of fleeces in this year’s competition. Finally, thank you to judges Mark Taylor of Schute Bell Badgery Lumby and Brett Cooper of Australian Wool Network, for their expertise. Funds raised from the sale of the wool entered in the competition will go back to the Association. Thanks to everyone that has submitted entries and have supported the competition in the past. We hope to increase the number of entries each year making the competition bigger and better! We encourage all ASWGA members, their immediate family and employees to participate. The competition aims to visualise the provenance and promote the excellence and dedication of ASWGA Members in the production and processing of their superfine Merino wool, achieving the highest quality standards enhancing this through the ASWGA Rams head™. All entries must be received at the office by 30 June 2019 to be eligible. The 2018 winners' photo, below. Titled “Counting Sheep” was taken by Carol Phillips “Glen Stuart”, Tasmania. For some time I have been taking pictures of everyday life on the farm. Through photos I am trying to capture how we manage our sheep, and showcase our property. In a dry year like we have had, we find ourselves moving sheep regularly, to keep a fresh pick in front of the sheep, and allow the paddocks and runs to refresh and regrow. Glen Stuart has many bush runs, and the sheep are often in small mobs scattered throughout the trees, hills and gullies. It is essential to count sheep into and out of paddocks/ runs to ensure none are left behind. This photo, taken with my mobile phone, shows how routine this has become for the sheep and us.